Manchester City jumped to second place in the English Premier League standings thanks to Raheem Sterling and more notes from this weekend. When Theo Walcott strolled through the middle of the Manchester City defense after five minutes on Sunday to give Arsenal the lead, it looked as if Pep Guardiola’s crisis was about to deepen. The City defense was, yet again, a mess, as Walcott found space and time to pick his spot. But it was Arsenal’s last shot on target in the match. City enjoyed a slight edge for the rest of the first half. It took total control after the break. Leroy Sané scored his first City goal after 47 minutes. In the 71st minute, Raheem Sterling, who had wasted an excellent headed chance in the seventh minute, drilled a shot just inside the near post. City won, 2-1, to jump to second in the table. It was the first time since 2012 that it had won a match after trailing at half time. In that time, City has rarely trailed at the half, but the stat says something about the team’s DNA. Part of the second-half change was tactical. Sterling started playing through the center with Kevin de Bruyne wide. Guardiola swapped Sterling to the right at half time and he cut in from the wing onto his strong foot to score. “We put wingers in the position of wingers,” Guardiola said of the second half, though his basic explanation for the victory was that, unlike in the previous home game against Chelsea, City took its chances. A true genius knows the right answer is often blindingly simple. City was a tad fortunate with those chances. One of Sané’s toes was offside before he scored. Then, Petr Cech said after the game, David Silva ran through his eye line as Sterling shot. Silva was offside, though whether he really blocked the goalie’s view seems debatable. “We need this kind of focus and desire,” Touré said. “What I asked the players is simple: play with enthusiasm and spirit and don’t receive complaints from our fans,” he said, before aiming a little dig at those fans, implying that City’s personality reflects that of its support. ARSENAL’S ISSUES Arsenal looked very good once again on Sunday—for about 30 minutes. For the second time in a week, Arsenal took an early lead in a big away game. Then when City, like Everton on Tuesday, wrested the initiative back in the second half, the Gunners were unable to change gears themselves. “It’s a shame because in the two game we were one nil up and we lost the two games, 2-1, and I think that we were quite in control,” Arsène Wenger told Sky. A winning manager can talk of “enthusiasm and spirit.” It is one of Arsène Wenger’s virtues that he is loath to publically blame any failings by his players in defeat. Wenger was also able to repeat his party piece, his well-rehearsed complaint about referees. RED CARD ROULETTE Tottenham also came from behind to beat Burnley, 2-1, at White Hart Lane on Sunday. Spurs won the game from the bench. Moussa Sissoko came on after 61 minutes with the scores level and transformed the game with his pace and power. Yet Sissoko often has only shaky control over that speed and strength. He was lucky to still be on the field in the 71st minute when he burst through the middle and set up Danny Rose for the winner with a precise pass. A minute earlier, Sissoko raised a boot and planted studs in Ashley Barnes’ knee. On Wednesday, at Stoke referee Anthony Taylor sent off Marko Arnautovic for an identical challenge. On Sunday, Kevin Friend showed Sissoko a yellow. There is an element of red card roulette in the way referees respond to wild challenges. On Wednesday, Craig Pawson chose not to send off Marcos Rojo, despite the clue in his name, of Manchester United for a two-footed lunge on Wilfried Zaha. On Saturday, after three days of abuse in the media, Pawson sent off Jamie Vardy for a similar but slightly less heinous tackle at Stoke. For all his gifts, Sissoko is clumsy. Twice the ball came to him in front of goal but he squandered the chances with his inability to control the ball. Clumsiness is no excuse for the challenge on Barnes, however deserving the target. The Burnley man’s studs and elbows are covered with the dried blood of his battered opponents. On Sunday, Sissoko escaped full punishment and Tottenham escaped with the points. BEING BORING Scoring is up. At just above 2.8 goals a game, the average is at its highest level in England’s top division since 1967-8, which is also the last time it was above three. There have been some thrilling matches. There has been some dazzling attacking soccer. On Saturday, the Premier League’s two form teams provided a reminder of the virtues of dullness. 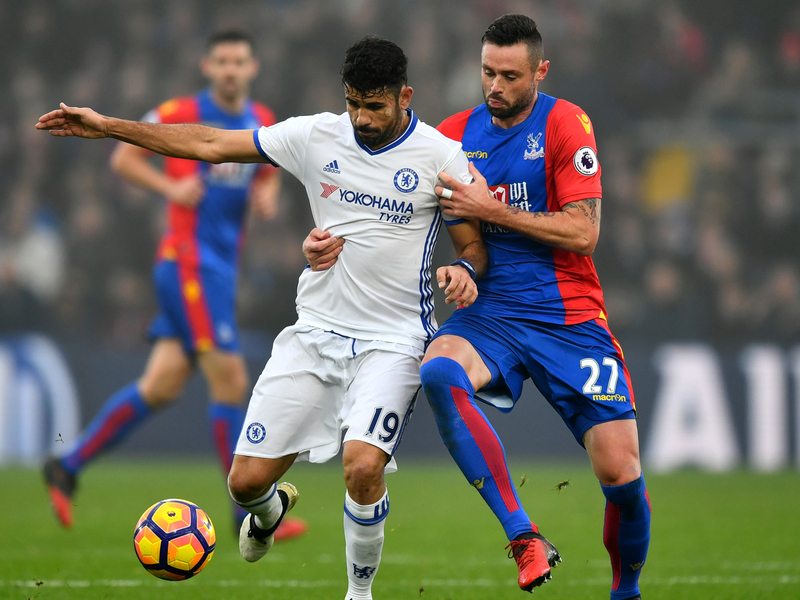 Chelsea recorded its 11th straight victory to move seven points clear, ahead of Liverpool's visit to Everton on Monday, as it won, 1-0, at Crystal Palace. It was Chelsea’s third straight 1-0 victory. Yet again, despite the narrow margin, Chelsea’s control was almost total. Manchester United cooled West Brom’s recent surge with a 2-0 victory at the Hawthorns. United, where José Mourinho took a little longer to find a formula that worked, has won three straight and is unbeaten in eight in the league. Both teams won with similar formulas: lock-down defense, smothering midfield and goals from the star striker. Diego Costa headed the only goal Chelsea needed just before half time. He is the top scorer in the league with 13 goals. Zlatan Ibrahimovic scored after five and 56 minutes to take his total in the league to 11, seven of those have come in six matches since November 6 – during that period he has also scored three goals in three cup matches. Both teams embody the attitude shared by Mourinho and many Italian managers, including, evidently Antonio Conte: when you are ahead you don’t need to take risks, or bust a gut chasing more goals. On Saturday, neither teams had any trouble putting that philosophy into effect. United managed five shots on target over 90 minutes. Chelsea managed six. More importantly, United allowed West Brom one strike on target, Chelsea allowed Palace two. Both winners were in comfortable control. Both teams are in danger of becoming dully predictable. Their managers are probably not worried. PENALTY PRIZE Saturday’s Premier League games brought three more penalty kicks, taking the total so far this season to 59. If referees keep awarding spot kicks at this rate, that will work out at 128 for the season, 37 more than last season and 22 more than the record during an earlier clampdown in 2009-10. Penalties, perhaps even more than red cards, are the most influential decisions referees make. On Saturday, spot kicks shaped the result in two matches. West Ham beat struggling Hull, 1-0, with a penalty. Stoke’s first goal, as it drew, 2-2, with Leicester, was from a penalty. The third penalty put Middlesbrough two goals up as it beat Swansea, 3-0. Often, referees lose their eagerness to enforce the rules strictly as the stakes in matches and the pressure from managers mount later in the season. Yet one of the striking aspects of all three penalties was not the tedious question of whether they should have been awarded. It was how they were taken. Mark Noble of West Ham, Bojan of Stoke and Álvaro Negredo of ‘Boro, all passed the ball gently into the net. Just as referees’ whistles tend to cool down over the season, penalty takers tend to warm up, as the expert on spot kicks, Ben Lyttleton of Sports Illustrated, has pointed out. This season is following that pattern. Penalty takers missed nine of the first 29 Premier League penalties. They’ve made 26 of the last 28. It used to be that penalty takers were told to pick a side, ignore the goalie and whack the ball as hard and a close to the post as possible. The thinking was that if you hit the ball well, no goalie would save it. The problem with that approach is that the margin for error is small and running up quickly to swing your boot hard multiplies the number of fast-moving parts. Over the history of the Premier League, slightly more than 25% of penalty failures have been the result of the ball missing the goal entirely. That’s embarrassing. No penalty taker wants a video of such a miss all over YouTube and Twitter. Penalties have been particularly attractive to the statisticians who have flooded into the game as soccer clubs attempt to mimic Moneyball. If you pretend that the shot and, therefore, the goalie, must go either right or left, it becomes a classic game theory calculation. That’s not quite true. Antonin Panenka, with his famous chip into the middle of the goal, and Geoff Hurst, who sometimes to rocketed the ball at the goalie’s head, both exploited the keeper’s tendency to gamble. And in those days, the goalie was not allowed to move before the kick was taken. Statistics suggest that the statisticians have made no difference. Perhaps since both the takers and savers are receiving advice, it cancels out. In the last 20 years, success rates in the Premier League have oscillated between a high of 83.9% in 2013-14 and a low of 65.8% in 2001-2, although that season also brought just 52 penalties, a Premier League low. The statistical approach encourages the notion that, for the taker, there can be a free lunch. The numbers suggest that if a goalie guesses right, his chances of saving increase 30%. Put it another way: If the goalie guesses wrong, the shot just has to hit the target out of range of the goalie’s trailing boot. A penalty taker, lining up the ball and seeing Thibaut Courtois or David de Gea looming, may quail at the idea of trying to strike the ball as hard as possible and hit a postage stamp inside the post. That fear, and the wish to hit a safe penalty but still score may explain the current approach. It involves another tricky skill: watching the goalie, not the ball, while running up. Bojan even stopped during his approach to encourage Kasper Schmeichel to make the first move. It worked. Yet what would have happened if the goalies, Schmeichel, Lukasz Fabianski and David Marshall, had called the penalty takers’ bluffs and stood still? How would Bojan, Negredo and Noble have reacted? They would have had to make a decision in the act of swinging their boots. If they had still attempted the same, gentle low shots, the goalies would have had time to react and save. Yet all three dived, in line with the game-theory calculations, and all three lost.